Becoming more and more popular amongst homeowners, bamboo flooring is an excellent flooring choice that’s actually been on the market for decades. If you have an active family or are just in search of a uniquely beautiful and safe, sustainable floor, consider getting a bamboo floor. 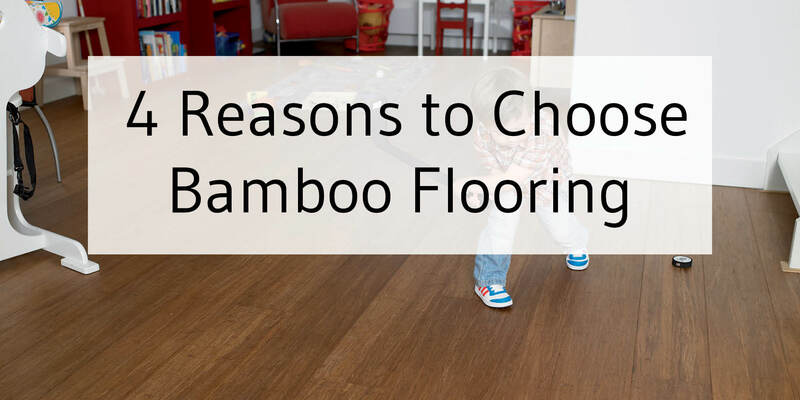 Here are four reasons to choose bamboo flooring for your home. It’s a common belief that bamboo flooring has a very set look and style. After being on the market for over 20 years, things have changed. Today, bamboo flooring isn’t all bland, strand grain, natural yellow or orange carbonized, not with MOSO® Bamboo Products. With MOSO® Bamboo Products, Tesoro Woods offers 7 unique bamboo flooring products, with different colors and different surface textures. Designed in the Netherlands, MOSO® Bamboo Products offers bamboo flooring with a wood flooring look, a rough look and a smooth, natural look. All products are still strand woven and strand grain, but they are definitely not bland. Take a look at all of our unique bamboo flooring products today. When strands of bamboo get woven together and then pressed and glued by a heater to make one solid layer of flooring, it’s a durable floor. To determine how durable a floor is, use the Janka rating. Bamboo has one of the highest Janka ratings, at 3014, much higher than your typical hardwood floors. And unlike many wood floors, bamboo floors are often resistant to dents and scratches, making them a smart choice for busy households and with pets. Bamboo is technically a grass, and is actually one of the fastest growing plants in the world. During the growing season, bamboo can grow up to 3 feet per day and can reach up to 65 feet within a couple of months. Talk about a rapidly renewable resource! Throughout its lifespan, all MOSO® Bamboo Products’ bamboo floors are CO2 negative, meaning that the plant will actually absorb more carbon dioxide than the production process will create. During the production process, the glues used are safe, no urea formaldehyde is added and the products contain less than 0.001 parts per million (ppm) VOCs to be considered No VOC. Coming out of the Netherlands, the Super-Strand Bamboo Collection has been certified by many European organizations, meeting very high standards. Learn more about MOSO® Bamboo Products’ European standards on our Indoor Air Quality Guide. To learn about our certifications, see our Environmental Attribute Guide. It’s important to know that not all bamboo floors are created equal. Many people think that bamboo is very susceptible to water and humidity, and isn’t that durable or stable because it’s poorly made in China. While MOSO® Bamboo Products produces bamboo flooring in China, they have control over the production process from beginning to end because they have a professional organization in China. With production oversight, a unique production process and specific product testing, MOSO® Bamboo Products’ bamboo flooring changes the way you should think about bamboo. All Super-Strand Bamboo Collection products are assembled as High Density®. In this unique production process, the bamboo strips are crushed before being glued under extremely high pressure. After treating and drying, the strips are compressed and glued under high pressure. The result is a floor that is one solid layer and even harder than the best tropical hardwood species, increasing the density by about 20lbs/ft3. When you talk about moisture susceptibility (shrinking or swelling), you’re really talking about the stability of the material. MOSO® Bamboo Products has developed a very extreme test to get an indication of products’ stability. After measuring the thickness, they put a sample in boiling water and measure it again, seeing how much the thickness has changed. For the Super-Strand Bamboo Collection, they allow 10% which sounds like a lot, but actually isn’t (remember, this is only under very extreme conditions). Comparatively, the “standard” strand woven quality normally has a change between 20% to 50%, 2 to 5 times higher than MOSO® Bamboo Products’. Our Super-Strand Bamboo Collection is a new, innovative line of bamboo flooring products that is perfect in active homes and with pets, a great sustainable flooring option and a quality material that will hold up in some of the most extreme situations. Buy your new bamboo floor today!